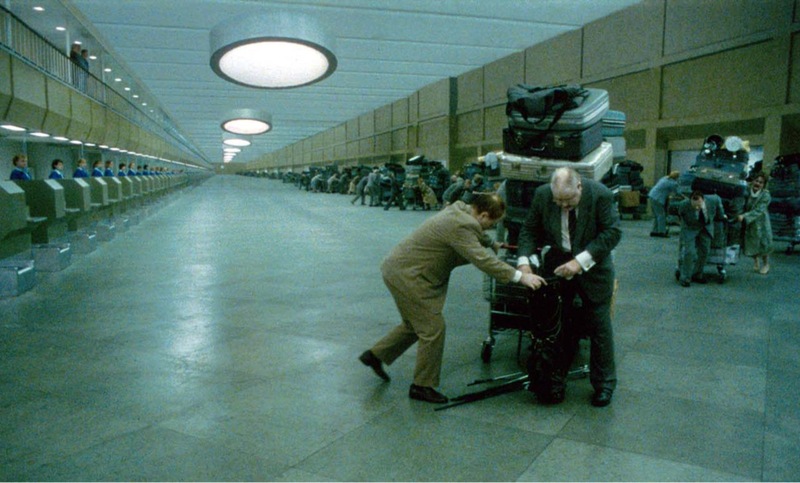 Swedish writer-director Roy Andersson explores human behavior and its consequences. His Living Trilogy of films, begun in 2000, takes stock of what it means to be a human being. What is human existence? In each Living Trilogy installment, brief but complete scenes pose questions about awareness, responsibility, and the weight of history in contemporary life. Even Andersson’s most farfetched images, often addressing the exploitative legacies of fascism, Nazism, and ethnic cleansing shared by all in the West, are disturbingly familiar. Over the span of fifteen years, each succeeding film was made in a largely consistent style that strives to close the paradoxical gap between dream and reality. Despite his dense material, Andersson’s touch is light, the occasionally farcical tone sympathetically mordant. Sharply lampooning society’s rules, expectations, and institutions, Andersson reserves his benevolence for flops and lost causes. At the offices of his distributor, Magnolia Pictures, and dressed in his customary faded jeans and casual checkered shirt, Andersson is sturdy, direct yet gentle, and curious even about his interviewer. Born into a working-class family in 1943 in Gothenburg, Sweden’s second-largest city, he retains a keen awareness of the pre-welfare state hierarchies and is clearly pleased to have lived in a more egalitarian time. For a while, a blue-collar distrust of anything that smacked of abstraction hampered his work. Fortunately, he let that bias go, though he retains a refreshingly no-fuss, workmanlike attitude. As described, Andersson’s idiosyncratic style can sound whimsical or arch: it is neither. The pre-title sequence of Songs does offer a clue to reading his movies. As a vertical white line moves across thumbnail stills, taken from all of Andersson’s films to date, the audio goes in and out like the sound of station-searching on a twentieth-century car radio. Though clearly part of Andersson’s Studio 24 logo, it is a useful model for a style that does not fit into any of the usual categories. His films are neither conventional narratives nor conventionally experimental. Though cinematic, and cinematically influenced, in particular by Federico Fellini and Luis Buñuel, he draws at least if not more from Honoré Daumier, Edward Hopper, and Samuel Beckett, among others. Watching his films, though, resembles thoughtful channel surfing. Andersson alights, then moves on, the segments (forty or more) of his films accretive rather than consecutive. He arrived at this method slowly. Italian neorealism and the Czech New Wave influenced his early work, especially his first feature, A Swedish Love Story (1970). Celebrated for this teenage romance, Andersson’s career faltered when critics and audiences shunned Giliap (1975), the more experimental project that followed. Lacking feature prospects but offered work in commercials, Andersson made of necessity a liberating virtue. Forced to telegraph his message, he spent twenty-five years discovering the possibilities of this abbreviated format, perfecting the sight gags and precision timing that give his often dire subjects such lightness. Even Ingmar Bergman, an advisor when Andersson was in film school, who was politically opposed to Andersson’s social welfare sympathies, numbered among the commercials’ ardent fans. His award-winning shorts, Something Happened (1987) and World of Glory (1991), and more than 400 advertisements helped fund Studio 24, Andersson’s unassuming headquarters in Stockholm, where he does nearly all his shooting. He begins with a “principal” idea, a half-finished script, and the rest contingent on what arises in the shooting process. Incident, not plot, anchors the scenes. He gleans his scripts from paintings, literature, history—and from memories of ordinary life, past and present. Characters central to one scene may surface in the background of another, as multiple vignettes move toward an idea rather than a resolution. 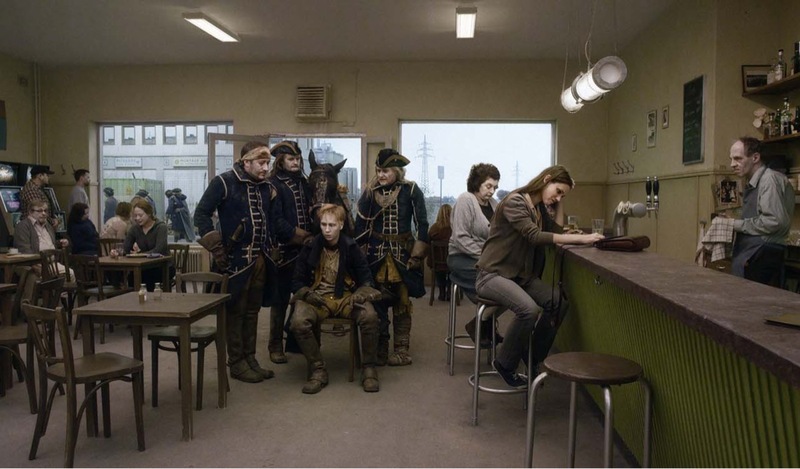 Compositionally, the scenes resemble figurative paintings. They distill action to its essence, detailing, in Songs, for example, the Sisyphean task of airline baggage check-in. By isolating and exaggerating what viewers usually take for granted, Andersson sets a slightly offbeat pace that subverts the inevitability of conventional cinematic linearity. He designs scenes as if they were entire segments, closer to paintings than episodes. Andersson dedicates Songs to modernist Peruvian poet César Vallejo, whose Stumble between Two Stars supplies the film’s epigraph: “Beloved are those who sit down.” Loosely organized around Kalle (Lars Nordh), Songs follows him as he wanders through an unnamed city, charred and blustering after having torched his own furniture store. Lines from Vallejo’s poem appear in the dialogue, most prominently in a scene when Kalle and his son (Stefan Larsson) visit his other son, Tomas (Peter Roth), who is confined to a mental hospital, Kalle gripes, because he “wrote poems until he went nuts.” Silent and still, Tomas enacts Vallejo’s benediction, sitting while his father rails about all that has befallen him. His brother, meanwhile, huddles close, reciting the poet’s lines. As Ursula Lindqvist points out, “the translated lines from Vallejo’s poem become alive in this film when they lose their literariness and become cinematic…. Andersson claims that the most pressing social and existential questions of our age come into focus in the most trivial, banal, and often absurd moments of everyday life (once again echoing Vallejo’s artistic vision of the momentousness of the everyday).”2 This emphasis on minutiae, on even the most prosaic moments as part of life, reverberates through the entire Living Trilogy. People, whether living in the limelight or at the margins, experience life more similarly than not. Pigeon begins and ends with waiting. At the outset, an impatient wife leans almost into the next gallery at a natural history museum, while her husband peers at each vitrine, including one with a pigeon on a branch. Bookending the film is a conversation both profound and absurd among passengers as they wait at a bus stop. Each scene is quite minor compared to the rest of the film, yet each is both recognizable and disconcerting. In between, Pigeon more or less follows Sam (Nils Westblom) and Jonathan (Holger Andersson), forlorn novelty salesmen whose efforts to brighten life with vampire teeth, laugh bags, and rubbery Uncle One-Tooth mask lead only to despair. Andersson rehearses the films’ deceptively simple dialogue ten or twenty times with each actor. Occasionally, their own traits or mode of expression lead to a change in the dialogue, but when shooting starts, nothing is left to chance. With the environment and actor set, the director often does as many as fifty takes. Every element serves the specifics of the vignette in total. As Andersson says in the documentary Tomorrow Is Another Day (2011), “Art is full of situations where people find themselves in frozen positions. They tell us a story without saying anything.”3 Yet for all the constraints, or perhaps because of them, watching the vignettes is freeing. The wide, unhurried shots encourage absorption; like paintings, the films reward multiple viewings. Strangely, the limitations of the form make the life that goes on before and after each vignette more imaginable, not less. Even though these images are no more than cardboard and plywood, there is a pleasure in letting the eye be knowingly fooled, in surrendering to the artifice. Andersson works mostly with nonprofessionals, his taste catholic as to background, age, and physical shape. His actors come from all walks of life, mustered from the street and from chance encounters, once even while shopping at Ikea. Fellini is an acknowledged influence, but the choices also reflect Andersson’s admiration for the figures in Edward Hopper and the New Objectivity painters Otto Dix and Georg Scholz. From Scholz, he borrows surrealist touches, from Dix an element of grotesquerie. And decay. Living Trilogy characters seem always on the edge of collapse, a sense reinforced by the camera’s lingering on scenes in a slightly discomforting way. Rejected by a potential retailer, Pigeon‘s Sam and Jonathan are shown packing up their unwanted novelties, the retreat from their rejecter’s office painfully slow. Like Hopper, Andersson notices aftermath, the way words can hang in the air like specters. All his characters are made-up in a light whiteface that is less greasepaint than whitewash. It is memento mori pancake. Andersson chose the look to emphasize what all humans have in common, not least that all are heading for the same exit. Costumes are often generic office-worker outfits, the colors humdrum, knees and elbows sagging. But though people may be weak or vulnerable, they are not humiliated. Like the whiteface, the generic clothes reduce traditional individuality, encouraging an idea of Everyman. The look of the actors meshes completely with the meticulously hand-built sets. Feats of imagination and engineering, the sets often rely on trompe l’oeil to suggest the mass and bulk of Andersson’s urban settings. Andersson gravitates to the unlovely spaces in which a great deal of life takes place: seedy cafes or bars, nursing homes, schools, lavatories and waiting areas, and most especially, the straitened rooms of modest flats. Commenting in Tomorrow Is Another Day, he says: “I think it’s extremely interesting to portray the human being in the room, that is to say the environment they happen to be in. The room tells us a lot about one’s place on earth and one’s situation on earth.” Characters appear in meticulous living still lifes, in which they are both vulnerable and of a piece with their abode, inseparable as an animal from its shell. In Pigeon, memory, personal and collective, becomes a form of environmental constant: people from different eras shift in and out or even simultaneously occupy the same space. In a three-scene suite of a toper’s memories, the first is set in Limping Lotta’s bar, his withered presence overshadowed by a pillar and even by the motherly barmaid. As he drinks a final shot, the screen goes black and a white 1943 title appears, followed by a scene set in the same spot, with Lotta (Charlotta Larsson) behind the bar. Centered in the shot, the now young toper is the object of Lotta’s singing attention as she swoops around the bar. Her limping movements dreamily smooth, she disperses shots to the paying customers. Sung to the tune of an old Swedish drinking song (recognizable to Americans as “John Brown’s Body”), her song is answered by two tables of penniless sailors and soldiers. How will they pay? From them, Lotta happily accepts kisses instead of kronor. The mood is buoyant yet melancholy, the feeling almost fluid. As the lame but irresistible Lotta busses each boy in turn, Andersson captures something of the delight and ache in even the fondest memories. Back in the present, with the singing still continuous on the soundtrack, the old man makes his halting way to the door, helped into his coat by the barmaid and customers, his departure a reminder of what awaits them all. Later, in a two-part sequence about King Charles XII (Viktor Gyllenberg), whose reign marked the end of the Swedish empire, temporality disappears entirely. En route to Russia, the king, his entourage, and troops virtually commandeer a modern-day café, banishing all the women and arbitrarily singling out one man for whipping. No one protests. A few scenes later, the troops return, routed and spent. War, then or now, is apparently grimly the same. The king, splayed flat against his horse’s back, can only say he needs to pee, but even royalty is subjected to a modern inconvenience: the gents is occupied. In Pigeon’s last elaborate set piece, novelty salesman Sam dreams of himself as a waiter, freshening the drinks of well-heeled elders who amuse themselves at the spectacle of white mustached colonial soldiers, with German shepherds at the ready, exterminating indigenous black people in an enormous copper cylinder. This nightmare merging of colonial brutality with a mid-1980s Chilean hazardous waste disaster specifically fingers as the culprit Boliden, a Swedish mining and smelting company. These are Andersson’s boldest references to the intrusion of past atrocities on the present. Music shapes all the films, from traditional Swedish songs to tunes further afield—such as the use of “Dixieland” in You, the Living. Reprising Limping Lotta’s song in Pigeon, Charles’s troops sing the king’s praises in Andersson’s elegant commentary on the multiple uses to which a rallying song can be put. Andersson’s dialogue is frequently and aptly compared to Samuel Beckett (an acknowledged inspiration, along with August Strindberg). Like Beckett, Andersson finds a rhythm in clichés. His dialogue for each film includes repeated platitudes—“the struggle to get food on the table and enjoy yourself” (Songs); “tomorrow is another day” (You, the Living); “I’m happy to hear you’re doing fine” (Pigeon). Spoken in differing contexts, sometimes by different characters, they become a refrain that delicately reinforces Andersson’s subtle pattern. “Inadequacy, shortcomings: life is full of them. Which is both moving and funny and even tragic,” Andersson says in the DVD commentary (Palisades Tartan) on You, the Living. To suggest bleaker moments, he fills the soundtrack with a kind of anti-music. In the You, the Living finale, a man’s dream of imminent destruction becomes apparent reality, as thirteen whirring B-52s loom over an unnamed city. Music is alive, complex; ruin merely a one-note drone. In Pigeon, the horrifying Boliden cylinder is accompanied by barking dogs, a cracking whip, harsh commands, and the wail of an infant, combining to form the execution’s dissonant fanfare. Death, of course, lurks all through the Living Trilogy, but in Pigeon Andersson achieves a form of absent presence, constructing scenes in which death, though not represented or embodied, seems present. Early in the film, white-on-black lettering announces “three meetings with death.” In each scene—a man’s sudden death, a woman on her deathbed, and a crisis in the wake of a man’s death—Andersson’s peculiar angle and careful placement of the survivors hint at a presence that is constant, insistent, and ignored. In the first instance, the widow is obliviously busy in another room; in the second, the children are obliviously squabbling over an inheritance; and in the last, ferry riders and workers are obliviously distressed about a dead man’s paid-for-but-uneaten lunch. Mortality, despite Andersson’s customary shadowless light, flickers through these scenes, almost tangible enough to see. Combining the fantastic with the practical, this is a cinema that belongs to Andersson alone. You’ve mentioned playing music and writing when you were younger. Did you paint also? When I was young, I wanted to be a painter, a musician, and a writer. I played trombone for a while in a brass band and I continue to paint. Of course, the film work combines both—and writing too. The trilogy marks your shift in features from your earlier realism to what you’ve called “figurative abstraction.” It began with something of a crisis, right? I started my career making realistic-style movies. I was and am a big fan of Italian neorealism, especially [Vittorio] De Sica. But after fifteen years of trying to make movies in his style, I was so tired of realism, I planned to stop even making movies. Were you constrained by more than professional considerations? I grew up in a working-class family, typical for Gothenburg. Though I learned French, German, and English at school, my parents did not know one word in another language. The working class really love realism. Abstraction was a little bourgeois, a bit upper-class style. My roots made me hesitate for many years. But I am still so happy that I took the chance. Instead you found inspiration elsewhere. Overnight, I suddenly felt, wow, now I should dare to leave realism. To go over to what I call abstracted style. I was inspired by the history of painting, and by Fellini and Buñuel. I am so very happy that I dared to do it. You have talked about working from what you remember of a reality, rather than researching to reproduce it exactly. Does that process allow you to get at something essential? If you remember your childhood, or anything you have seen, reconstructing that memory will lose a lot of details. You will purify and condense it. That is why I like to make scenes that are as condensed as memories or dreams. How do you keep track of the scenes you collect? Unfortunately, I don’t write them down. Sometimes I miss some fantastic scenes, which is a pity. I have to be more careful in the future. The other day, I don’t know if it was in Stockholm or London. Pouring rain. I saw a little girl, about seven years old, holding an umbrella. I couldn’t see her face. The umbrella was colorful and had little ears, maybe cat ears. Her father, a tall man, was bent low, tying her shoes, getting wetter and wetter as she stood there. That’s enough of a scene to be in a movie. You often work with very slight, often mundane events, specifically, the two little girls in Pigeon who are just blowing soap bubbles on an apartment balcony. They figure nowhere else in the film and say almost nothing, except when one manages to catch a bubble. Yet it is memorable. Think of the history of painting: almost everything is interesting to look at. I was just paging through a history of English painting and saw a picture of a girl sitting in a room with a green apple in her hand. The title: Girl with a Green Apple. It’s beautiful. You always include a scene before your titles appear, like a kind of overture to the rest of the film. Do you think of them that way? I want people to wonder what kind of movie they are about to see. In Pigeon, I wanted the audience to wonder: what is this, what is going on? I like for people to be a little confused or curious about what will happen. Placement of the actors seems to be as important to you as the lighting and sets. Do you choreograph their movements? I figure out where I want them in the room. Body language is very important, how people behave, and tempo. Tempo is very important. In Pigeon, of course, there was some real dance work for the flamenco scenes. I visited many flamenco schools and teachers. I learned a lot from visiting flamenco rehearsals. It took a lot of patience, but Lotti Törnros, who played the teacher, learned how to do it. You talk about pace or tempo, but much depends in your work on timing as well. There’s one scene in Songs of Lars Nordh and the woman (his wife or mistress) in a bedroom. Lying among the satin sheets, she faces the camera, her back to him even as he tells her he burned down his own business. I laugh when I think of how that scene turned out. He has ruined his company, but all she says is, “You could have called.” She’s a bit aggressive. You could at least have called. It is a real disadvantage to not know Swedish when watching your films, since you depend so much on inflection. The scene in Tomorrow Is Another Day of you running lines with Håkan Angser, who played a weary psychiatrist, was very instructive. Is the dialogue set when you start to work with an actor? I have a rough idea of the dialogue, firmed up only when I have an actor for the scene. Then I rehearse a lot with the actors: ten, maybe twenty times. You do a lot with foregrounding and backgrounding characters. In Pigeon, there is a scene with a military man outside a restaurant trying to find out why no one else in his party has arrived. At the moment he rather apologetically tells someone he probably got it wrong, the flamenco student is breaking up with his teacher. The real action of the scene plays in silence— and in the background. This is very special. It’s the clearest example of my efforts to show things happening in the fore- and background simultaneously. And silences became longer and more complex as the trilogy progressed. Yes, consciously so. For example, in Pigeon, there is the scene of the manager of a big company who we assume will commit suicide. For a long time, he is just standing there, the only sound a thunderclap. He just stands there, pistol in one hand, cell phone at his ear, listening, and you start to wonder will he shoot himself or not. Finally, he says, “I am glad you are feeling better.” But until that point, he is telling you everything silently. It seems like another carryover from painting, where leaving out certain details makes the picture come alive. What the eye sees as a pearl bracelet in Rembrandt, for example, looks blurry and indistinct up close. You often strip things down, suggesting rather than showing. I am often very jealous of painting. Jealous because I feel that movie history does not have the same quality as painting history. I really want movies to be as rich as painting can be. 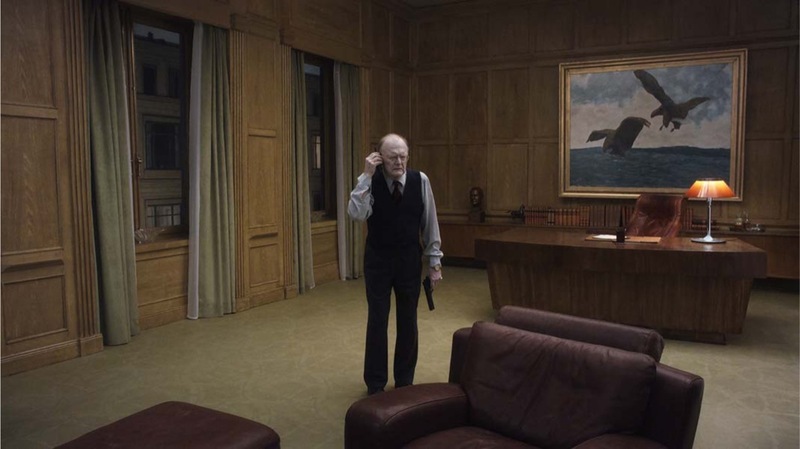 Certainly that room, with no visible exit, the color scheme dark brown and green, feels like Edward Hopper. There’s the loneliness. And also the lighting. I am interested in shadowless light, light that illuminates all the time and shows people nakedly exposed. Hopper seems to be very important to your work. It’s the loneliness. His paintings are beautiful and sad at the same time. 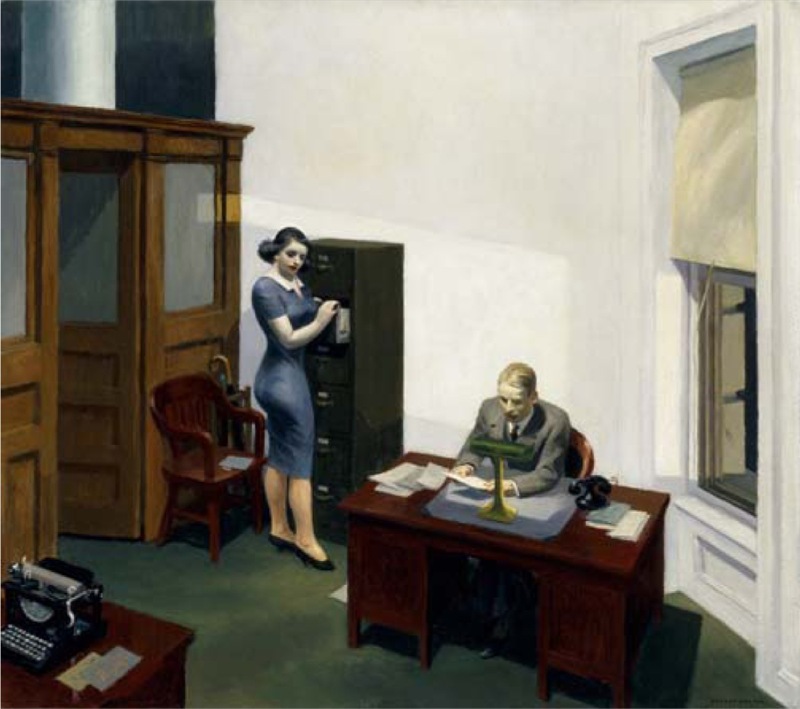 He made a fantastic painting titled The Office at Night where the secretary is standing beside the man in the office. He is about to say something or he just said something. The painting is about waiting, but it is almost moving. It’s a kind of movie. The figures are in a brutal light there, too, similar to your company manager. Yes, my light is without mercy. That company manager is especially defenseless. Hopper’s Office at Night and the company manager scene both show people waiting, an activity to which you often return. Pigeon was your first feature to use digital techniques. Are you glad you made the transition? I am so happy I started to shoot that way. Analog style has become like the Stone Age for me. It is helpful to have the monitor right next to the camera so you can see right away. In the past I had to wait a day to see what we shot. Now I can see immediately. The best shot remains to be discovered later, but it is great to rehearse and shoot with that monitor. Until recently, I wouldn’t have believed I could work like that, but I’m very happy to have found it. Did you have to resort to any digital effects? In two scenes. I used digital techniques to prolong Charles XII’s procession of horses. It was not possible to have a thousand horses in the studio (laughing), though we did have twenty or thirty. And in the scene with the colonial cylinder, the fire is digital. That final scene becomes more harrowing every time I watch it: the soldiers, the dogs, the violence of herding the people into the cylinder. And then the reflection in the terrace glass, parting the curtains and the formally dressed elderly watching it with cocktails. It’s these people on the terrace who belong to a responsible generation. Maybe they were not personally involved in such cruel things, but they are part of a generation that behaved that way. In the commentary to the Songs from the Second Floor DVD (New Yorker Films), you spoke about “guilt in the face of existence” and the personal responsibility you feel for the collective past. I’ve been engaged in what I call reconciliation about how we behaved in war, to poor people, and to others exploiting them. It’s heavy stuff for me and important. That sense of responsibility seems to be also a product of your youth. I was born in the 1940s. When Sweden created the welfare society it was also called the “solidaric” society. Compared to when I was growing up, Sweden has step by step moved away from that solidarity. But I still think it’s a good way. How can this planet survive without responsibility for nature and for other people? You have spoken about art as a way of getting clarity. I wonder if there are things that became clearer for you over the course of making the Living Trilogy. Yes. (hesitates) Yes, I get clarity from making and shooting the scenes, then looking at them later. I’ve become a little more clever, a little wiser. I see how a so-called anachronistic scene can be important for our time. In Pigeon, when Charles XII and his troops are coming back from losing the war with the Russians, the bar tender points to two of the women and says, “You became a widow in Poltava. You got the widow’s veil.” They break into tears. I’m happy that I came up with that scene to talk about it in that way. It’s from Brecht, it’s his text. My work always involves literature and painting. Sometimes not so obviously, but at the least as a source of inspiration. You change the perspective from the glory to the misery of war. We are really living in both our time and the past all the time. Everything is affected by what has gone before. Are you at work on another project? Yes, I have done some research, contacted members of the team, and there is a script. I will be wilder next time. Special thanks to Jane Ljung at Studio 24 and to Susan Norget and Rob Scheer of Susan Norget Film Promotion for assistance with this interview. 1. 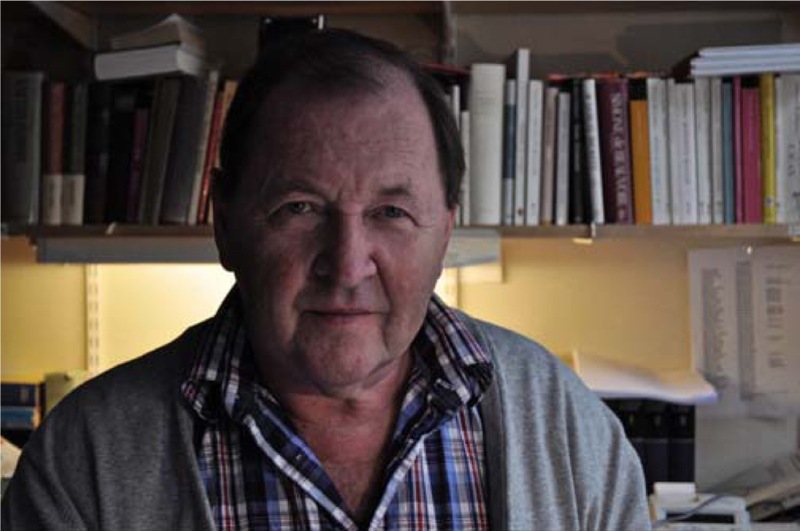 Jonna Dagliden, “Roy Andersson: ‘I’m trying to show what it’s like to be human.’” The Guardian, August 28, 2014. 2. 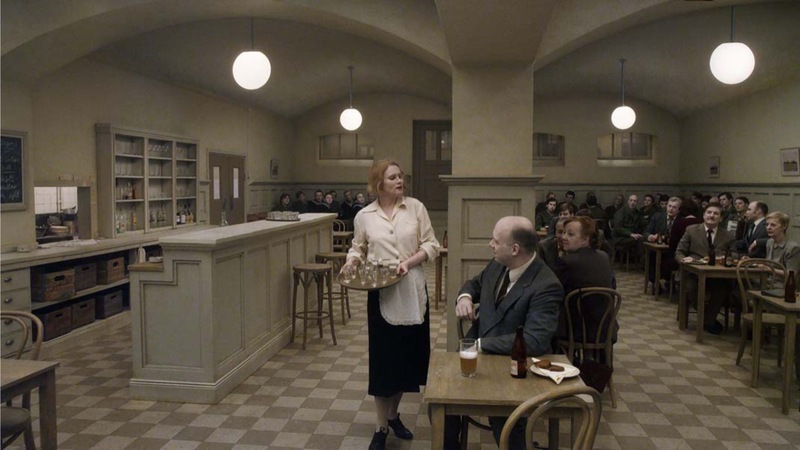 Ursula Lindqvist, “Roy Andersson’s Cinematic Poetry and the Spectre of César Vallejo,” Scandinavian-Canadian Studies 19 (2010): 200–29. 3. To understand what gives the films their simultaneously unknown and vaguely familiar feeling, see the invaluable documentary Tomorrow Is Another Day (2011), directed by longtime crew members Per Ahrte and Johan Carlsson.